You are currently browsing the category archive for the ‘Radical Islam’ category. This has been going on for awhile, but you know what I don’t see? I don’t see my wife and other Buddhist in Asia declaring Buddha Jihad against these Muslims and flying to Thailand to join in an armed struggle against them. It seems of all the major world religions only Muslims act like that. BOMBINGS, shootings or, more recently, al-Qaeda-style beheadings now happen almost every day in Thailand’s southern provinces. Bloodthirsty but strangely publicity-shy separatists attack symbols of Buddhist Thailand’s rule over a region whose people are mostly Muslim and ethnic-Malay. 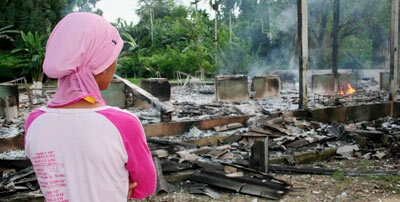 Teachers and monks, not just soldiers and police, are targets now. Muslims are also regularly murdered, either in revenge for killings of Buddhists or because the militants suspect them of collaborating with the authorities. In the most gruesome incident of recent days, an elderly Buddhist man was beheaded in Pattani province on February 8th. His head was later found in a roadside plastic bag. A note reportedly left near his corpse said it was revenge for a grenade attack on a Muslim tea-shop. The conflict has risen and subsided several times since Thailand annexed the region, formerly a Malay sultanate, in 1902. Violence surged again in 2004, since when around 2,000 people have been killed. When a wave of bombs hit Bangkok on New Year’s Eve, Thailand’s military government was quick to deny the insurgents had planted them. It blamed supporters of Thaksin Shinawatra, the prime minister deposed in last September’s coup. But one of several police squads investigating the explosions now says that a suspected southern militant was caught on camera near one of the blasts. The violence continued unabated as Malaysia’s prime minister, Abdullah Badawi, visited Bangkok this week. Mr Badawi offered to mediate with the militants. In late 2005 Mr Badawi’s predecessor, Mahathir Mohamad, already out of office, brokered talks between separatist leaders and Thai officials. But Thai ministers later contradicted themselves on whether Mr Badawi’s offer was welcomed. What the Thais do want is help sealing the border, across which southern Muslims, including militants, easily slip. Mr Badawi and his Thai counterpart, General Surayud Chulanont, agreed on measures to stop people holding both Thai and Malaysian identity cards; and Malaysia will offer training to boost Thai Muslims’ job prospects. Mr Badawi has an incentive to help, since he clearly does not want what his foreign minister this month called a “hotbed of international terrorism” to emerge on Malaysia’s doorstep. But the treatment of Thai Muslims is a sensitive subject in northern Malaysia, where the country’s Islamist opposition is strong. So Mr Badawi will not want to risk providing political ammunition to his opponents. Co-operation would be a welcome change from the two countries’ frequent rows over the Thai south. Mr Thaksin used to accuse Malaysia of sheltering the militants. He was furious when, in 2005, it refused to send back around 130 Thai Muslims who had fled across the border, claiming their lives were in danger. Since the Thai coup, there have been tensions over a security barrier that the Thai generals want to erect along the border. The Malaysians were miffed at General Surayud’s claim that funds were being raised for the insurgency by extorting money from restaurants selling Thai tom yum kung soup in Malaysia. Mr Thaksin dismissed the separatists as “bandits” and tried to crush them by military force. This led to atrocities such as the Tak Bai massacre of October 2004, when Thai soldiers gunned down at least six Muslim protesters and then killed 78 more, mostly through suffocation, by cramming them into army trucks. Last year Mr Thaksin clashed with Sonthi Boonyaratglin, his army chief (and a Muslim), who wanted talks with the rebels. Soon after, General Sonthi led the coup against Mr Thaksin. The military government has been more conciliatory. General Surayud has apologised for the Thaksin government’s brutal mishandling of the conflict. Around 90 southerners, held for two years over the Tak Bai incident, have been released without charge. And a civilian-led agency to oversee the southern provinces and build links with local Muslim leaders—which Mr Thaksin had scrapped—has been revived. But, as General Surayud admitted this week, this softer approach has yet to show results. He also lashed out at his fellow general, the army chief, for failing to make the south more secure, complaining that his work “does not meet our expectations.” The national police chief was sacked earlier this month, ostensibly for failing to solve the Bangkok bombings. Duncan McCargo, an academic studying the insurgency, says the Thai security forces have proved incapable of fighting it. The militants’ success means they are under little pressure to negotiate or even to spell out what exactly they want. The obvious solution is “special autonomy” for the Thai south, like that granted to the Philippines’ Muslim south and to Indonesia’s Aceh province. But this is a distant prospect. It may be extremely hard to persuade ethnic Thais to let southerners govern themselves and to give their Malay dialect official recognition. Some Thai nationalists are even demanding that Buddhism be made the state religion in the new constitution now being drawn up. Mr McCargo says an eventual solution may demand a leader with a strong democratic mandate—as Indonesia’s President Susilo Bambang Yudhoyono had with Aceh. General Surayud is, sensibly, warning his countrymen that the road to peace will be arduous. The danger is that itchy generals tire of talking and revert to seeking military solutions, becoming once again the separatists’ best recruiting-sergeant. What Is It To Be A Malay?? KUALA LUMPUR, Malaysia, Aug. 19 — From the scant personal details that can be pieced together about Lina Joy, she converted from Islam to Christianity eight years ago and since then has endured extraordinary hurdles in her desire to marry the man in her life. Her name is a household word in this majority Muslim country. But she is now in hiding after death threats from Islamic extremists, who accuse her of being an apostate. In a series of decisions, the civil courts ruled against her. Then, last month, her lawyer, Benjamin Dawson, appeared before Malaysia’s highest court, the Court of Appeals, to argue that Ms. Joy’s conversion be considered a right protected under the Constitution, not a religious matter for the Shariah courts. “She’s trying to live her life with someone she loves,” Mr. Dawson said in an interview. Threats against Ms. Joy had become so insistent, and the passions over her conversion so inflamed, he had concluded there was no room for her and her fiancé in Malaysia. The most likely solution, he said, was for her to emigrate. For Malaysia, which considers itself a moderate and modern Muslim country with a tolerance for its multiple religions and ethnic groups of Malays, Indians and Chinese, the case has kicked up a firestorm that goes to the very heart of who is a Malay, and what is Malaysia. Her case has heightened a searing battle that has included street protests and death threats between groups advocating a secular interpretation of the Constitution, and Islamic groups that contend the Shariah courts should have supremacy in many matters. Some see the rulings against Ms. Joy as a sign of increasing Islamization, and of the pressures felt by the government of Prime Minister Abdullah Badawi as it tries to respond to the opposition Islamic party, Parti Islam Semalaysia. About 60 percent of Malaysia’s 26 million people are Muslim, 20 percent are Buddhist, nearly 10 percent are Christian and 6 percent Hindu. Malaysia has powerful Islamic Affairs Departments in its 13 states and in the capital district around Kuala Lumpur. The departments, a kind of parallel bureaucracy to the state apparatus that were strengthened during the 22-year rule of former Prime Minister Mahathir Mohamad, run the Shariah courts. They also ruled that a request to change her identity card from Muslim to Christian had to be decided by the Shariah courts. There she would be considered an apostate, and if she did not repent she surely would be sentenced to several years in an Islamic center for rehabilitation. Because of the death threats, including some calls to hunt her down, Mr. Dawson said, he could not say where she was, and could not make her available for an interview, even by telephone. Similarly, her fiancé, whom Mr. Dawson referred to as Johnson, a Christian of ethnic Indian background whom Ms. Joy met in 1990, had received death threats and was not prepared to be interviewed. Last month, Prime Minister Badawi appeared to side with the Islamists when he ordered that forums organized around the country to discuss religious freedom must stop. The forums, run by a group called Article 11, named after the section of the Constitution that says Malaysians are free to choose their religion, were disrupted on several occasions by Islamic protesters. The chief organizer of the Article 11 forums, a well-known human rights lawyer, Malik Imtiaz Sarwar, a Muslim, received a death threat this month that was widely circulated by e-mail. Mr. Malik, 36, who presented a brief in support of Ms. Joy to the Appeals Court, said he was seeking police protection. “We must not confuse the crucial distinction between a country in which the majority are Muslims, and is thus an Islamic country, and a country in which the supreme law is the Shariah, an Islamic state,” Mr. Malik said. Conversions of Muslims to Christianity are not common in Malaysia, though most converts do not seek official approval for marriage and therefore do not run into the obstacles Ms. Joy confronted. One 38-year-old convert, who said in an interview at a Roman Catholic parish that he would provide only his Christian names, Paul Michael, and not his surname, for fear of retribution, described how he led a double life. “Church members know us as who we are, and the outside world knows us as we were,” he said. He was fearful, he said, that if his conversion became public the religious authorities would come after him, and he could be sentenced to a religious rehabilitation camp. One such place, hidden in the forest at Ulu Yam Baru, 20 miles outside the capital, is ringed like a prison by barbed wire, with dormitories protected by a second ring of barbed wire. Outside a sign says, “House of Faith,” and inside the inmates spend much of their time studying Islam. Paul Michael said he and other former Muslims moved from church to church for services to avoid detection. They call themselves “M.M.B.B.,” for Malay Muslim Background Believers. “It’s a group of Malays who are no longer Muslims,” he said.